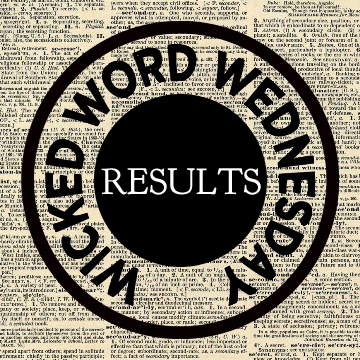 Wicked Word Wednesday had a slightly better week last week with a total of three participants and a fair number of views. Now, if only those lurking in the shadows would come out and play. Honestly, we don’t bite! She smiled and dreamed of jumping on top of her desk, hoisting the black flag and slitting a few throats. I’m sorry, Ms. Brodsky, even if it is casual Friday, the parrot stays home. The Jolly Roger rippled in the wind as the ship came about, her buccaneer captain at the wheel. The pirate crew held fast awaiting orders, ready to board the British supply ship crippled by their cannons’ fire. Congratulations to this week’s winners (don’t forget your badges!) and tune in Wednesday for another Wicked Word! Jay, I’m sorry I keep missing this! I’ll try harder for next week and I’m going to repost on my blog. I’m taking blogging 201 and hopefully some enthusiastic new bloggers will join the fun! Woo Hoo! Thanks for the promotion! Welcome; it’s good to see you back! Wicked Word Wednesday is a word game I developed as part of Blogging 201. You can read the full rules here, but the long and short of it is a 24-hour writing contest based around a single word. The post with the most “likes” by midnight Sunday earns the right to use a winner’s badge. Check it out – the next one starts at midnight!